Established in 1992 the Friends support the Collection by various means. Working at the Passmore Edwards Centre, or at home, we assist Devon Libraries with their specialist railway collection. 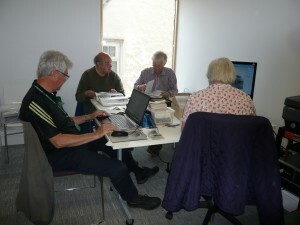 Each Wednesday the Friends do research to identify and record details of railway related images that are new to the Collection. Researchers are always needed to identify images which come in without anything written on the back! Our talks consist of a presentation on a railway theme given by an ex-railwayman, a current project manager or an enthusiast on a specific topic. We are always interested in hearing new speakers. Please get in touch if you have a particular interest you would like to talk about. Meetings are held on the first floor of the Passmore Edwards Centre, Newton Abbot and start at 7pm. All are welcome to attend. The Friends of the Railway Studies Collection have free entry; guests are also welcome and are invited to make a small donation of £1. A group of the Friends go to the Exeter Garden Railway Show each year to sell any duplicate copies of books that have been donated to them. We use these funds to purchase newly published titles.